This is your last chance to catch Jadé Fadojutimi's show in her first exhibition at a public institution. Jadé also took over PEER's Instagram account, follow us to get behind the scenes access to her studio and practice. 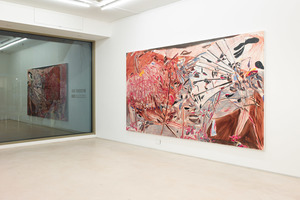 Jadé Fadojutimi and Matthew Collings at PEER. 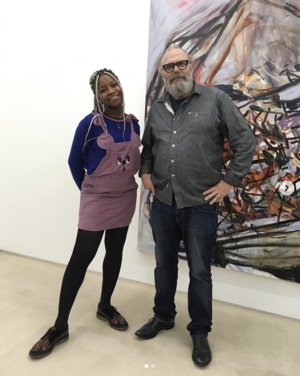 On Friday 15 March, Jadé Fadojutimi and acclaimed writer and artist Matthew Collings joined us for an evening of discussion about Jadé's work and influences. We are pleased to announce that Rebecca Moss will be the first artist commissioned for our new PEER Notices and PEER Ambassadors programme, supported by Paul Hamlyn Foundation. Rebecca Moss is an artist based in Essex and East London. Her practice critically examines heroic narratives in relation to landscape, taking the form of site responsive absurdist videos, performances and interventions. She has previously led Digifest Workshops at Focal Point Gallery, Southend. PEER Notices is a unique chance for Rebecca to work on a public art project on Hoxton Street with the PEER Ambassadors across one year. We were deeply saddened to learn of Bill Culbert's death on 28 March. He will be remembered for his generosity of spirit and conceptual rigour by all of us who had the great pleasure of knowing him and working with him. We are immensely proud to have commissioned his site-specific installation State of Light in 2009, and many will have seen his extraordinary presentation in Venice when he represented New Zealand at the 2013 biennale. Juan Araujo, Detail of: Sculpture Landscape-the Arch, 2019, Oil on canvas, 37 cm x 50cm. 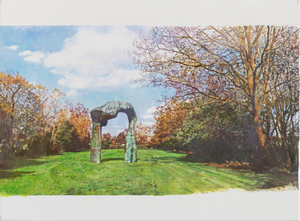 Juan Araujo has created a new series of paintings and multimedia works based on photographs he took during research visits to the Henry Moore Foundation in Perry Green, Hertfordshire and the Barbican Centre, London in early 2018. These two sources enabled the artist to pursue one of his long-term preoccupations – the consideration of how various articulations of modernist histories can be variously read through art and architecture, and the connections between them. Over the coming weeks residents and visitors to Hoxton will see bathtubs literally sprouting up in various nooks and crannies. These have been salvaged from the recent flat renovations and planted by local residents and groups to brighten up the street. Through a series of workshops with experienced garden designer Jane Heather and artist Olivia Mathurin, local residents are learning about plants, deciding on the planting and co-designing artworks for the exterior of the tubs, meaning the planters will be enjoyed both for their nature and as art! Keep an eye on our PEER Local pages for more information. PEER wish to appoint an evaluation consultant to work with the team carrying out our ambitious two-year project, PEER Notices and PEER Ambassadors. The role requires an experienced researcher and evaluator able to work closely with the team – primarily the Curator for Local Audiences (CfLA), two PEER artists and 32 PEER Ambassadors – to support self-evaluation, acting as a critical friend and an external eye while bringing a degree of objectivity to the process and building internal capacity. Wednesday 10 April 2019 at 12 noon. Interviews will be held during the week of 15-18 April 2019.